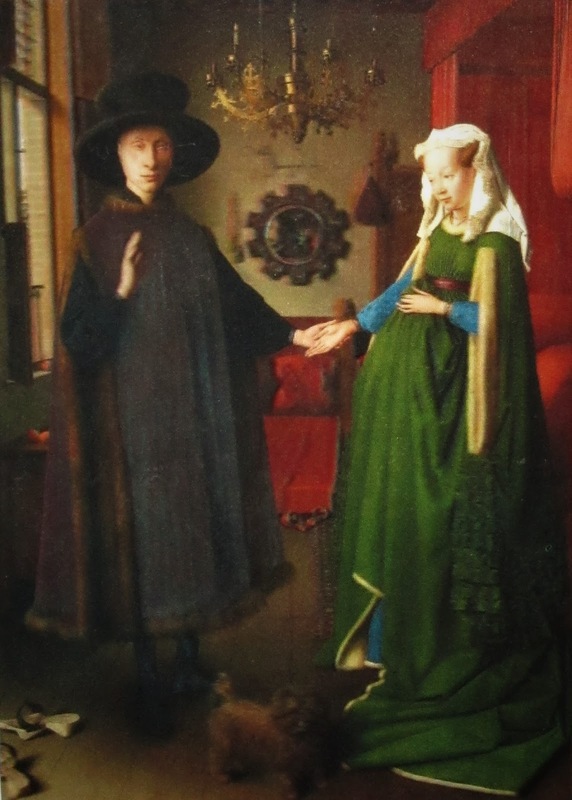 In 1434 Jan Van Eyck painted the Arnolfini wedding. It is on display at the National Gallery in London (NG186). I bought a 3D postcard of the painting in the National Gallery shop but the 3D effect did not photograph very well. Most people's first thought when they see the painting is "was she pregnant?" However, the dress is of the floaty style ladies used to wear at the time. Of greater interest is the mirror at the back on the wall. 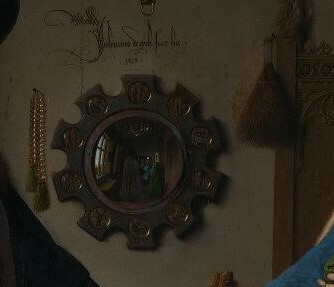 Above the mirror Van Eyck has written in Latin Johannes de Eyck fuit hic which means Jan Van Eyck was here. Looking into the mirror we can see the backs of the bride and groom and two other figures. Possibly they are Van Eyck and his assistant. What is clear is that the mirror, which is convex, is of excellent quality and gives a sharp image. The finest mirrors available at the time where Murano mirrors. Henry VIII and Francis I of France both collected Murano mirrors. The Isle of Murano in Venice was called the Isle of Glass. Van Eyck's painting was considered to be lifelike so the representation of the mirror must have been true to the quality available at the time in the early fifteenth century. In an earlier post I mentioned Van Eyck's image of the Moon in his crucifixion diptych. However, there are three other Van Eyck painting of the Moon. The Madonna of Chancellor Rollin has an image of the Moon although it is hard to see. 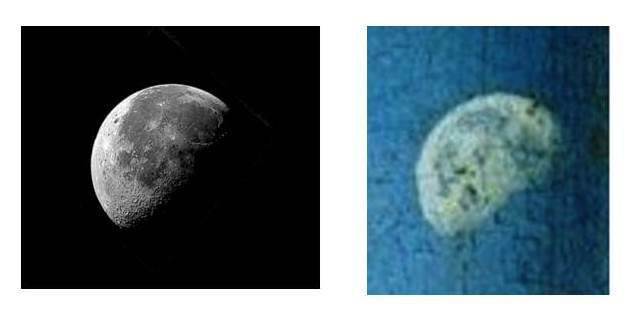 The Moon can just be seen in the left hand section (bottom right below). The other two are on the Ghent Altarpiece from 1426 to 1432 (top left) and the Turin-Milan Hours (bottom left). Van Eyck must have studied the Moon to have produced these images as his paintings have a photographic quality and influenced the Pre-Raphaelites in the 19th century. Here are all four images side by side. There are outlines of maria on all images although it is hard to identify them with real features. 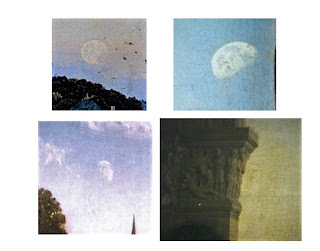 They seem to fit the outlines of several maria for example one dark area on the crucifixion (top right) represents the Seas of Serenity, Tranquility, Fecundity, Imbrium and Nectaris and other dark area roughly corresponds to Oceanus Procellarum, Mare Nubium and Mare Humorum.